Earth, the planet where all types of lives exist is also one of the rolling planets. We find constant changes on the earth that affects our existence and the ozone layers in space have a major role to play in our lives according to our life styles. This is obvious, and we don’t need any scientist to tell humans. 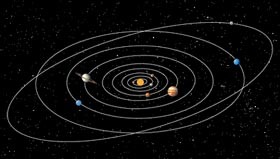 There are other rolling planets that are moving at their individual pace around the sun; this is also science. It is a matter of ignorance to treat earth as the universe and think all lives are isolated from the grand cosmos. Everything that is not created by man is interlinked. The planets keep influencing each other as per their individual quality. Any energy that incarnates on the earth has to go through the process of life and it cannot be that formulated energy is without a purpose. People who take birth and die eventually bond in some way. For example- we don’t meet everyone on this earth; we connect with only those with whom we have a relationship. The energy finds its way to fulfill our purpose. Astrological science found its place in human lives before 3rd century B.C., the agnostics or the theologians have no knowledge of this science as it is very ancient and time tested. When a baby is born, why do you note his time and date of birth? Why do you need it if he is going to exist and die like any other animal? His time of birth indicates his personality, character, his profession, luck, married life, children, etc when one makes his chart as per the latitude and longitude of the planetary position. This is his balance sheet. If his balance sheet is fixed, then why should I consult an astrologer? Everyone cannot read the balance sheet; as only an accountant knows to prepare the balance sheet of your company, astrologers can know the calculation of your chart. Astrology can give one the guidance to be cautious when the planet is not favorable, alert one on calamities, plan on future, marriage partner s personality and how to adjust to the changing period in one s life. There is always a curiosity in man to know his future as he himself cannot visualize it; hence astrology acts as a guru if you go to a good astrologer who is learned, has spiritual qualities, passion to help people around him and above all at peace with himself. All the 12 raashis and zodiacs whatever you call them hold various planets at different times in their domain and they influence individuals according to their birth charts. Astrology is a proved science and Vedas give lots of importance to the grahas(planets) in the prayer and they are revered as deities and there are mantras to appease them. The mantras are time tested and have specific meaning to suggest their character and their influence on all the lives on the earth. It is futile to argue on something we have not studied or mastered; it is like challenging medical science when I am not a doctor. We have to visit the hospital when we get sick; sometimes astrological science helps man when he is confused about his life. Temples, churches and mosques in India, astrological guidance, visit to the ashram, family support, and community system have kept us away from psychologists. Psychology is a science too but Indian way of life is again time tested and helps one to accept and move on in life. Mere verbalization of emotion cannot solve the mental issue; one has to learn to accept changes in life and lead a healthy life. If one finds the astrological prediction going wrong, it is the astrologer who has not interpreted correctly. Astrology is science and we have to discover the truth.